Share the post "A Home that has it All"
Knowing I was going to have a busy day today, I was sure to get to the office earlier than normal so to be all the more prepared for the hours ahead. There were emails piling up that needed to be answered, research to be done, and other miscellaneous chores outside the office. When you find yourself at the office so early, that it’s still dark outside, you sometimes wonder if you’re possessed, or a glutton for punishment, but in truth it’s neither, simply because I hate being rushed to get things done. Rushing provides all the more opportunity for mistakes, and in real estate sales, mistakes can be disastrous. 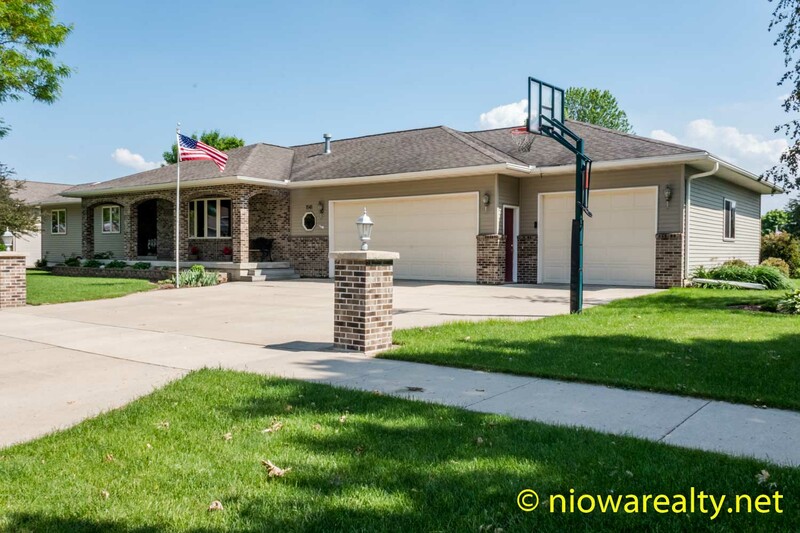 At the request of the owners, I went back out to 1137 Manor Drive this morning to take new interior/exterior photos of this exceptionally well built and maintained home in one of Mason City’s sought after districts. Since most buyers cannot see past furniture and decorating, the sellers were good enough to “thin out” their possessions to where their home is more showable. I’ve been in many ranch homes built in that period, and I’d say it has one of the best sized and layout of its kitchen/dining area. It was likely custom built for its first owner because of the extras it offers which a spec builder would not have included. I’ve stopped counting years ago the number of homes I’ve sold in that subdivision. Believe it or not, there are still a few original owners living there, and one of them happens to be a now retired real estate broker I worked with for over 10 years. Just these past days, I’ve been reminded again how annoying it is when you’ve hired someone to do a job, given them instructions which they understood and agreed upon, and the next thing you know, they’re doing only half of what they said they’d do along with not following instructions. For this reason, I nearly always call tradespeople I know and trust, but there are those times when you have to call someone more specialized in a field, and wouldn’t you know it, there’s usually an unwanted surprise. The highlight of my week was being given the opportunity to list an absolutely gorgeous home located at 1141 – 14th St. SE here in Mason City. It’s a custom built one-owner that offers far more amenities than you’d find in today’s market. From the moment I pulled up, I knew it was going to be a treat. If you’re wanting square footage, it has it and more. If you’re needing bedrooms, it has five. Always needing that extra bathroom? This home has three and a half. Looking for a man-sized 3 stall garage? This home’s garage will more than meet the need. It’s located on a half acre lot in Stone Pillar Addition which has been a very popular subdivision since it was developed. The biggest of its extra features, is that it’s basement floor is heated, the garage floor is heated, and the section of the driveway out to the first “cut” is heated. You may think their utilities are off the charts, but in reality, they’re not. The budget billing for gas and electric is only $176 per month. Without a doubt, 1141 – 14th St. SE is a home that has it all, so tell friends, relatives, and co-workers because I don’t see it lasting on the market. Tonight’s one-liner is: If you can’t be perfect, at least be good.